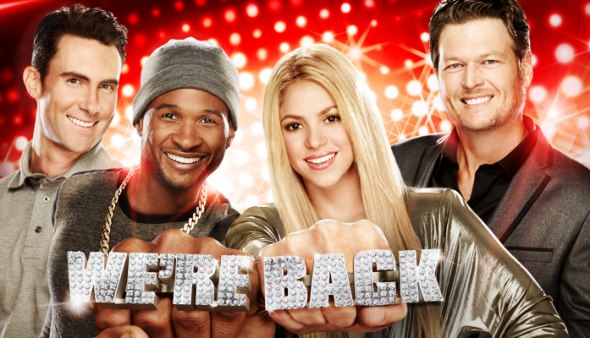 NBC‘s highest rated series has returned for a sixth cycle with Adam Levine, Blake Shelton, Usher and Shakira as judges. Will this show continue to help the peacock network rebuild its schedule? We’ll see. A singing competition hosted by Carson Daly, The Voice typically airs twice a week — usually on Monday and Tuesday nights. These are the Tuesday ratings. 3/19 update: NBC has renewed The Voice for next season. 5/21 update: You can see the rest of the latest night’s ratings in context. For comparisons: The Tuesday editions of the Spring 2013 cycle averaged a 3.8 rating in the demo and 12.15 million viewers. I’ve always loved the Voice and the talent blows me away every year. I think the chemistry between the judges helps to make the show. I would like to see more of the performances. It seems they skip around and sometime don’t even give all the judges a chance to express their opinions. I liked the Voice at first, but lately they have been short circuiting some of the singers by only showing a short snipit of their performances. That’s not fair to them or the viewers. They should have less of the stereotyped drama of coaches and competitors and more of the actual performances. I’m beginning to wonder if the whole thing isn’t just scripted with winners and loosers already decided. IF they keep going the way they are, I’ll be watching less and less.